This purchase includes a hard copy of the 13th Edition Study Guide and a copy of the same book in digital format as our eBook. The eBook is available for download immediately upon your purchase. The cost includes both books and the shipping of the hard copy book. For details on the eBook, including the types of devices it can be downloaded to, click here. Note the terms and conditions of the eBook as you will need to agree to them before completing this purchase. For details on the hard copy book, including contents, chapters, and recent updates, click here. 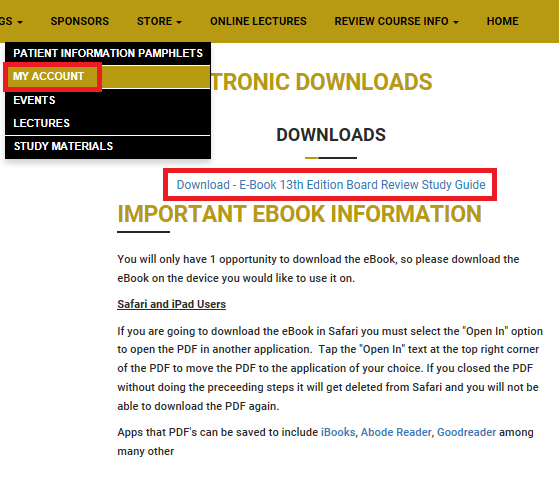 I agree to the Terms and Conditions of the eBook Study Guide. Hard copy Study Guides are shipping from the Goldfarb Foundation office in Camp Hill, PA via UPS Ground. Books are typically shipped within 2 days of your order being received. Below is a map from UPS showing estimated ground delivery timeframes from zip code 17011. Download and viewing instructions available here. From the time of purchase, you will have 30 days to download your e-book. The e-book can only be downloaded to one device, and you will only have 1 opportunity to download the eBook, so please download the eBook on the device you would like to use it on. After you have made your purchase of the eBook, navigate to the "Store" tab in the navigation bar at the top of the page and click on "My Account". Under "My Electronic Downloads" you will see a section where you can download the file. This is your file only and can be downloaded one time. The email address association with the account at www.goldfarbfoundation.org which you used to purchase the eBook will be your password to open the file every time. If you are going to download the eBook in Safari you must select the "Open In" option to open the PDF in another application. Tap the "Open In" text at the top right corner of the PDF to move the PDF to the application of your choice. If you closed the PDF without doing the preceeding steps it will get deleted from Safari and you will not be able to download the PDF again. Apps that PDF's can be saved to include iBooks, Abode Reader, Goodreader among many others.